Happy Monday my friends. I hope everyone had a great weekend. Mine was good, up until Sunday afternoon when we were on our way to shoot these photos, and ended up getting a flat tire. Luckily we realized our tire was flat before we left our neighborhood, so I was able to take the twins home while Mike got the spare on the car. However, by the time the car was drivable, it was too dark to shoot photos, which is why this post is coming late in the day. Thankfully, I have an amazing husband who used his lunch break today to play photographer, and didn't complain about it one bit. You may recognize this faux fur vest from Friday's post. I love the statement that a fur vest adds to any outfit, and how versatile wearing one can be. On Friday I showed you a casual look, and how this fur vest easily took my everyday jeans and booties up a stylish notch. Today I'm showing you how to style it for a date night out, or drinks with the girls. Because the vest is such a statement piece on it's own, I wanted to keep the rest of my outfit simple, so I chose to wear all black. I paired it with my faux leather pants for a little edge, and dressed up my look with my studded heels. Although I love the idea of wearing pink or red for a Valentines dinner date, I have a feeling this is what I would end up wearing! Happy Friday my friends. I feel like this week has been a long one, yet it's gone by quickly. Does that even make any since? Those who follow me on social media may have noticed that I've been a little absent from Snapchat and Insta Stories this week. I ended up getting a laser treatment (IPL) on my face this past Monday, and have looked like a hot mess. I did give a little update on my Insta Stories yesterday, so you may still be able to catch it. I've had a few people ask me about the process, so I'm thinking about doing a post on the procedure in the near future. Anyway, now that I'm looking a little less scary, I'll hopefully be back to my normal snapping soon (Rach480). In other news, can we talk about how much I'm loving this faux fur vest? I wasn't sure if the shag style fur was for me, but the second I put it on, I was sold. It adds the perfect amount of edge to an outfit, while adding a layer of warmth. A double plus in my book. I decided to go for a casual, and slightly boho, look by pairing it with a flowy blouse, distressed jeans, and booties. My blouse is a few years old, and still one of my favorites. I love that it works for pretty much any occasion, from a music festival with denim cut-offs, to the office with a pencil skirt and jacket, or with skinny jeans and pumps for a night out on the town. Although my blouse is no longer available, I've rounded up some great, similar styles below. 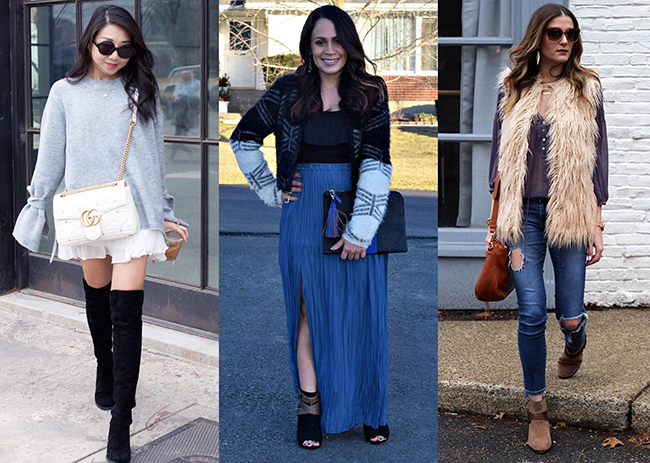 The feature blogger is Megan from The Fashionista Momma. I'm loving how she paired her printed dress with the leather for a perfect date night look. Make sure to stop by her blog and say hello! Working out is a large part of my life, and something that I haven't shared much about on the blog. Ever since I quit the gym, and found at home workouts that I love, moving my body has become an everyday essential. I'm a huge fan of Beach Body work outs and Kayla Itsines Bikini Body Guide (currently on my third round), and am usually mixing the two together. The fact that I can just throw on leggings and press play while the twins are napping, gives me no excuse to miss a workout. However, since I don't leave the house to get my sweat on, I don't usually care what I'm wearing, so my workout clothing game is pretty sad. Sure I have some nice stuff from my Pure Barre days, but with that being over two years ago, they're pretty much all worn. This wasn't a concern of mine until recently, when I had to start being out of house early in the mornings to take the twins to music class and daycare. I usually dress in my activewear so that I'm motivated to get moving when I get back home. Let's just say my outfits have been pretty embarrassing, which is why my current wish list is all about activewear. I'm in desperate need of some new leggings, and love that there are so many higher rise options. These Zella leggings would be perfect for running around town, and love that they come in a a few colors, including black. Also, how fun are these moto leggings and these mesh inset ones? Since I am always cold, I love throwing on cute sweatshirts, and would live in this cardigan. I'm also obsessing over the cut out detailing on this Free People hoodie. When I leave the house in leggings, I always like to have my bum covered, so this long tank is perfect. It's also time for me to get a new water bottle and this gold S'well one make the perfect accessory. I'd love to hear, what are some of your favorite workout brands? The end of January is typically the time that I start dreaming about spring. However, living in New England I know we have a long way to go before that time arrives, and I can walk out the door coatless (except that it was in the 50's this past weekend and I actually went to the store without wearing a jacket). In order to cure my spring fever, I begin to break out the lighter colors in my wardrobe. There is something about wearing light colors that just has a fresh feel, and blush has been my go-to color. I recently added this blush lace up sweater to my wardrobe and have been wearing it non stop. Not only is it cozy, but I love the boxy fit and lace up detailing on the back. Its both sweet and and little sassy, which also make a perfect option to wear on Valentines Day. To give it a spring-like look, I paired it with my favorite white jeans (also obsessing over this white pair here), and finished my look with taupe colored boots from White Mountain Shoes. 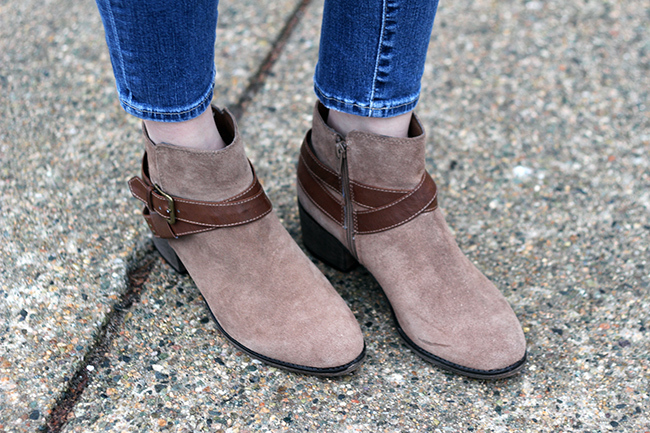 These boots are the most comfortable pair that I have ever worn, and they're on sale! I love how the light colors paired together gave me a spring look, yet it is both warm and cozy, and perfect for getting through the rest of these winter months. *This post contains sponsored content and affiliate links. All thoughts and opinions are my own. Thank you or supporting the brands that I love here on Threads for Thomas. As much as I love wearing all the the season's trendiest pieces (off-the-shoulder forever), sometimes I just feel my best in classics. In fact, there is nothing that I love more than wearing a pair of distressed denim with a tailored blazer or classic button down, which also happens to be my go-to outfit when I'm rushing out the door. January also tends to be a time when I cut back on my shopping. Sure there are some really great sales going on, so I may get an item or two, but nothing major is being added to my closet. Which means I need to be creative when putting outfits together, and classics make the perfect pieces to restyle. Layer a white button down under a lace up sweater, or throw a blazer over your slip dress or lace camisole. In fact, blazers are my favorite items to restyle because they can make almost any outfit appear put together. The blazer I am wearing is from J.Crew and I've had it for years! I layered it over my Rails plaid button down and love how it made my plaid appear polished and sophisticated. To add a little edge to my otherwise preppy look, I paired my blazer with fringe hem jeans, and finished my outfit with a gold choker. I love how this look could easily take me from a meeting, to lunch with the girls, or be a great option for a causal Friday. I want to thank everyone for your kind words and encouragement on Monday's post about my new business venture. I'm excited about this new chapter in my life, and can't wait to see all the new opportunities it brings my way. If you haven't already, make sure you go enter the giveaway! Wishing everyone a wonderful weekend! We have a guest co-host this week! Audrey from Five Foot Nothing Shopping is sharing her petite style with us. Make sure to check out her blog for great fashion and food tips. The feature blogger is Kristina from The Kontemporary. How beautiful is her pleated skirt? I love her update on this classic look. Make sure to visit her blog and say hello! If you follow me on social media, it's no secret that I love subscription boxes. Not only is it fun to get a shipment of new stuff delivered monthly, but I love the surprise of not knowing what is going to be in each delivery. I am often sharing all the products that I get on my Instagram, and unboxing them on Snapchat (Rach480). Although some that I receive are sponsored, where I get them for free in exchange for a product review, a couple of them I subscribe to myself (and pay full price) because I love the service. So when Glossybox reached out to me to review their January box, of course I had to say yes. 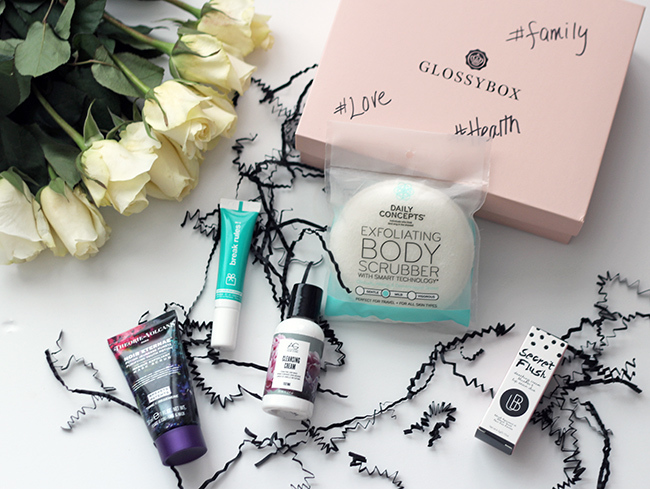 Glossybox is monthly beauty subscription service, where each month you are delivered five deluxe sized beauty products to try. What I love most about Glossybox, is upon signing up you fill out a beauty profile, so the items in your box are based upon your beauty preferences, and not just selected at random. The service is $21/month, which you can read more about, and sign up here. AG Hair Cleansing Cream Foam -Free Hair Wash: I was very excited to try this shampoo because it's ideal for super dry or brittle hair, which I have. Not only do I love the smell, but my hair felt so good after using this product. I was a little worried because it says that I don't need to follow with conditioner, but it left my hair soft and tangle-free on its own. This is a product that I will definitely continue to use. 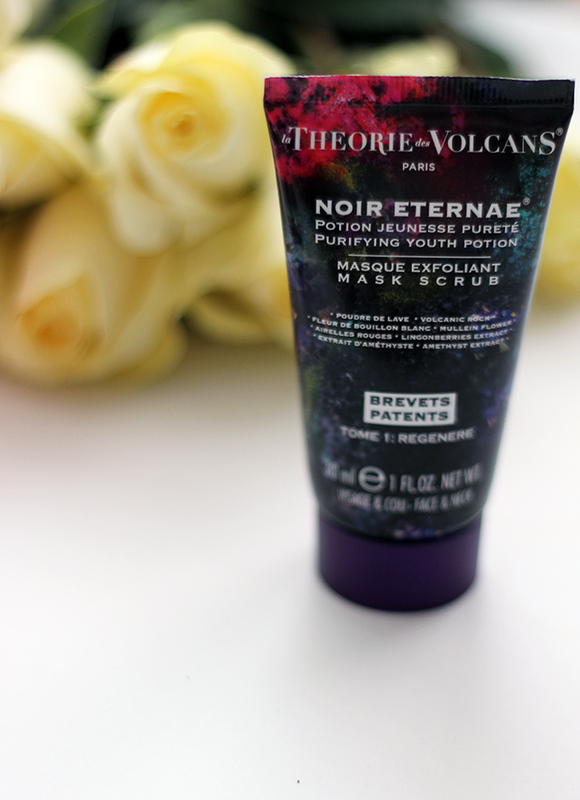 La Theorie des Volcans Noir Eternae Youth Potion Face Scrub: This face scrub is used to remove impurities, redness, and dead skin cells. You can use it as a daily cleanser or a purifying mask. I tried it as a mask, and it left my face feeling clean and soft. oOlution Eye Love: This eye cream claims to provide you with wide awake eyes, even after a night of partying. It suppose to rid of dark circles, and make the bags under your eyes magically disappear. Although my dark circles still exist after applying, I do love the feel of this eye cream, and will continue to test it out over the next month. 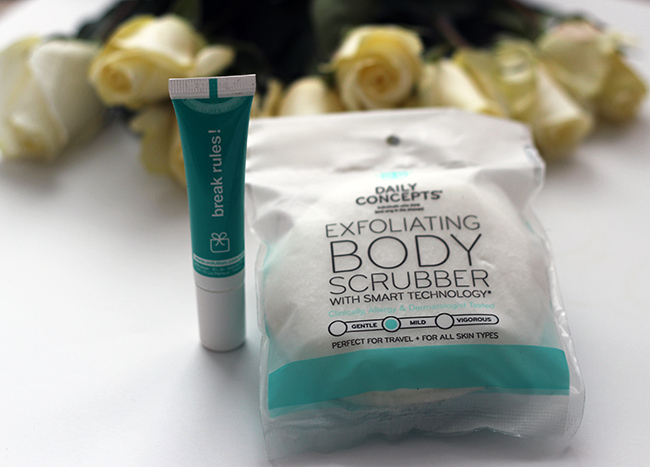 Daily Concepts Exfoliating Body Scrubber: A perfect scrubber for your showers that leaves your skin exfoliated and soft. 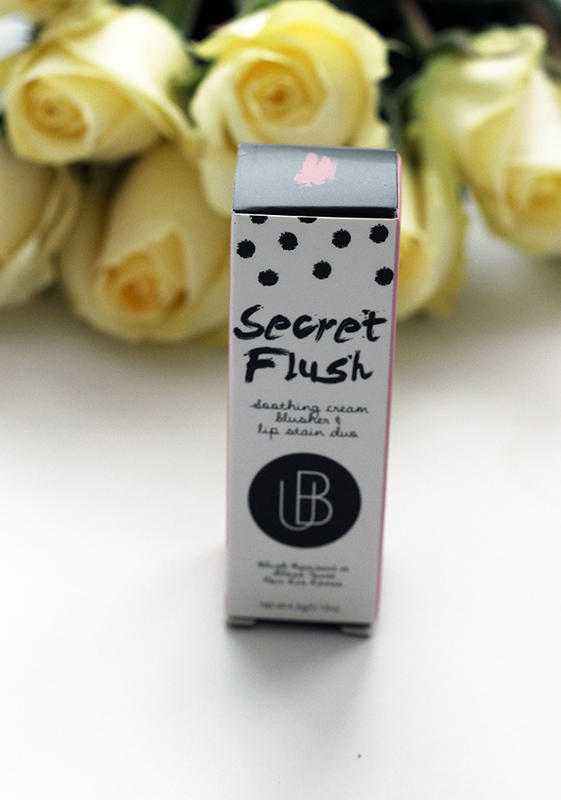 Universal Beauty Cosmetics Secret Flush: This is both a cream blush and lip stain in one. I love multi-purpose products, and the color of this one is ideal for both the lips and cheeks. If you read Monday's post, then you know I probably won't be using this on my lips, but this is perfect for my cheeks. I love how smoothly the color went on, plus it is perfect for throwing in my travel cosmetic bag, and reapplying if I need a little color throughout the day. Even though Glossybox is usually filled with brands that I love, I was unfamiliar with all of these brands in my January box, which is why I love the service, and subscription boxes. If these products weren't in my box, I would never have thought to try them out, which means I would have never discovered my new favorite shampoo! Tell me, have you tried Glossybox or have a subscription service that you love to use? If so, what are your favorites?